The latest Communique brings you more Ship Cards, scenarios, fiction, and more news from the Star Fleet Universe! It can be downloaded from the Commander's Circle. We continue to improve the Commander's Circle. (Please make note that it is now at a different location.) We have now uploaded all of the ships and scenarios as separate documents (the ships are organized by empire) so you can quickly see what is available. Check it out! The big release this month is the FC: REFERENCE RULEBOOK. This product has all of the rules from all of the FC products, all of them re-edited, updated, including all rulings and updates, and in alphanumerical order. The big news for next month will be the 30TH ANNIVERSARY CUSTOMER APPRECIATION SALE, when all SFB rulebooks and SSD books (sold as spare parts) will be half price from June 1st through July 31st. This is a good chance for SFB players to replace their worn-out books, and for non-SFB players to acquire these books (possibly for use with FC). This does not include orders through stores, non-SFB products, or components other than rulebooks and SSD books (and Captain's Logs #18 through #29), and does not start until 1 June 09. The big release last month was FC: BRIEFING #2. 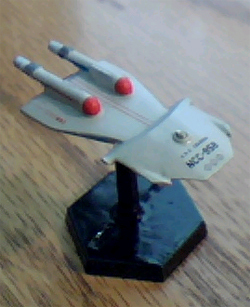 This product has more ships in it (72) than any previous Federation Commander product. Many are Middle Years versions of ships already in the game, but some are entirely new ships never in Federation Commander before (and at least one of them isn't even in Star Fleet Battles yet). This product covers THE MIDDLE YEARS, the period before the General War covered by the original series. Don't forget our original (discus-based) BBS where most product development takes place! You close in for the kill, you smash the facing shield, then your enemy grabs your last drone in a tractor beam and turns a fresh shield to you before you can fire again. Rather than fire everything at your enemy's ship, keep one drone in reserve. Once he has fired all of his weapons, grabbed a drone, and turned a fresh shield to you he will think he is safe. Now, launch your remaining drone at the drone being held in the tractor beam. Rule (3A3) Friendly Fire allows you to target your own seeking weapons. According to rule (4F5c), when a drone targeted on another drone impacts that drone after the second drone has impacted its target and been tractored, both drones score damage on the second drone's target. The damage from both drones (24 points) will be scored on a down shield, facing away from the launching ship. A savvy player will drop the tractor and allow drone B to impact before drone A can reach its target, but this will still score 12 points of damage on the targeted ship. When defending a wedding cake, have your ships sortie immediately on the side opposite from the enemy approach. 1) You can dump a bunch of power into the outermost web ring (this should be standard anyway). b) It can be a nasty surprise when he does finally come to grab you. Make sure to hit this same shield with all your phasers the same impulse before he can turn. It should be obvious that the idea here is that the ships will move out to lay the mines, but then withdraw back behind the web barrier to support the base's defense. With Advanced Operations has come the raiding pool. The Alliance can make great use of these raiders by taking out province-holding E4s and F5s. You need to stop this. When you are holding three to four provinces, all connected, such as in Eastern Hydran Space or Federation territory, put two province holders into each province. Mini of the month by Jeremy Gray. Communique #41 has been posted to the Commander's Circle. "Keep after him," Williams said to the helmsman. "Strakhorn, are you ready?" "Full overloads," Strakhorn said. "Let's do this." "Kezlok, are you ready?" she asked. The Klingon was now her primary weapons officer. "Yes," the attaché responded. "I have the drone rack and phasers ready in case of seeking weapons." "Fighter squadron commander, are you in position?" "Position in attack I am," came the voice of an Arcturian, reminding her too painfully of her dead navigator. The second squadron of Arcturian fighters had maneuvered around in front of the Juggernaut, and began launching drones from 290,000 kilometers, their fighters spread out in a wide arc across the bow. Williams was surprised to see the first squadron flying along with them, launching more drones, and then realized that those must be short-ranged anti-fighter drones which could never hurt the Juggernaut, but might confuse it. She had argued against letting the fighters spread out, but the fighter leader was convinced that this was the best way to get hits. "Juggernaut is turning to starboard, but is still very slow," Donaldson reported. "Helm, bear to port and try to keep at shot at his tail," Williams ordered. Her eyes flicked to the tactical screen to see that Kearsarge was right behind Eagle, closing in for the kill. The wave of missiles coming at his bow concerned Beta, but it was only a matter of timing. He wanted to let the smaller cruiser get as close as possible before turning to fire, and the incoming missiles put a definite limit on how long he could wait for this. The equations did not add up for the Juggernaut's plan, and he began to maneuver to starboard to string out the missiles, which lost their closing angle and began pursuing the slow-moving monster. The first of them hit the bow, which surprised Williams, but the Juggernaut was using its armor, and a few phasers, to buy time. Ken Burnside asks: If an X-ship armed with plasma takes a heavy weapons drogue, does the drogue have plasma-L torpedoes on it? There is currently no rule (XG34.0) for this, so (XA3.0) seems to apply. ANSWER: An X-ship would deploy a non-X heavy weapons drogue. Advanced technology drogues may be added in the future, but there are none currently available in the game system. Follow-up question: Rule (XFP14.0) says that all X-ships have carronades. (FP14.14) says that the ISC and Romulans never deployed carronades. Am I correct in assuming that ISC and Romulan X-ships do NOT get carronades? ANSWER: Specific rules override general rules, and (XFP14.0) is specific to X-ships and overrides the general rule of (FP14.14) which applies to non-X-ships. It is not any different than (XD6.56) which installed UIMs on Kzinti and Tholian ships armed with disruptors that were previously prohibited the use of the system. Follow-up question: Rule (XFP1.251) says there is a chance for a failed launch (XFP1.252), but there is no such rule - should I assume that this is a "ghost reference" to the old fast load discharge rule? Rule (XFP8.0) also says there is a chance for a misfire on fast plasma bolts (the generalized note in the rules says "no discharges from quick loads"). Rule (XJ3.4) still has a reference to two free points of ECCM via (XD6.393). Are all of these "ghost references"? Q: A quick question on (509.35) and SOP Step 2B7. Does this include newly-built pods? Can I designate an existing tug to carry a battle pod that I built the same turn? My reasoning is that I assign mission of "battle tug" and the pod is shipped out by those "dedicated staff officers" as soon as it is built. A: Yes, but that's not the way you do it. Rule (509.35) refers to newly-built tugs, not newly-built pods, which are covered under (431.22). Newly-built pods are built in Step 2B3 and are assigned in Step 2B7. So, yes, your "dedicated staff officers" will make sure they get to where they are assigned in time for them to be used by your tug. Q: How do independent fighters that have moved into the hex by Reaction Movement work in capital assaults? A: They are grouped as independent squadrons and used per (205.7) and can be placed in either the mobile or static forces. If placed in the static forces, they must return to that system each round. Q: The F&E rulebook has been reprinted several times (1986, 1990, 1991, 1993, 2000), and only the latest is "valid". Are the counters from earlier editions of the game different? A: Check the SIT for each empire to see what the counter value should be. If it is different, toss it out. I have very large bag full of old counters (I had several sets, only a few of each sheet changed value) that don't have the current value. I can't force myself to throw counters away. 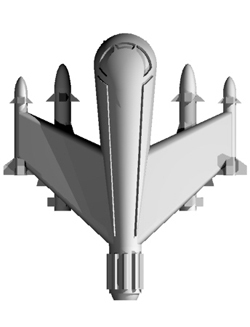 This is a 3D model of the Klingon ZY fighter due for release at Origins.